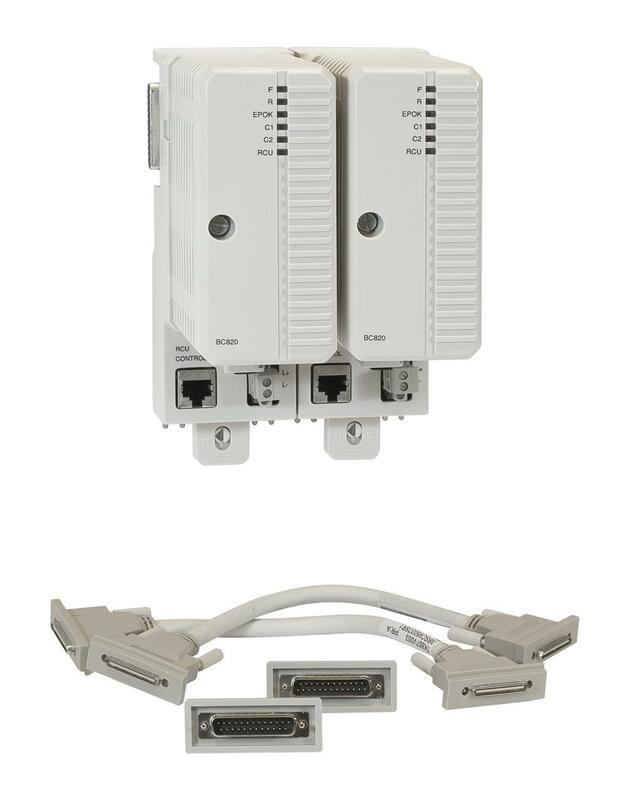 The CEX-Bus unit BC820 is used for extending the on-board communication ports with communication interface units. It is also possible to use redundant communication interfaces on the CEX-Bus. The BC820 CEX-Bus Interconnection Unit offers a way to section the CEX-Bus into two independent segments up to 200 meters apart. This improves availability in systems with redundant communication interfaces. BC820 can be used with PM858, PM862, PM866 (PR.F or later, which corresponds to PR:H or later for PM866K01), and PM866A. The BC820 is powered from the processor unit via the CEX-Bus and can also support the CEX-Bus with redundant power thrugh its external connector for power supply. BC820 transmits the RCU-Link and extends the CEX-Bus and RCU-Link cable length up to 200 m. The number of CEX-Bus interfaces is limited to 6 with each BC820. RCU Control Link: Modular Jack, RJ45, shielded twisted pair crossover cable with all four pairs crossed: EIA/TIA-568 standard crossover T568A to T568B. Length: max 200m. RCU Data Link: The optical interconnection is compatible with LC Duplex optical connector interface conforming to ANSI TIA/EIA60-10 (FOCIS 10A). The type of optical cable is 50/125μm OM3 fiber. Length: max 200m.